During a normal pregnancy, an unborn child’s lips and palate form in the second or third mouth. Cells fuse together to create the orofacial structures and prepare them to function in the outside world. However, sometimes the cells do not fuse properly. This leads to a cleft (an abnormal open space). In many cases, a cleft lip or palate is due to genetic factors; either the more or father can pass on a gene that causes the condition to occur. Sometimes, environmental factors contribute to the defect. It is also possible that a child has the gene for a cleft lip or palate but then an environment factor actually causes the cleft to form. 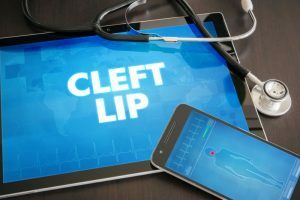 However, despite all the possible causes of cleft lip, it isn’t uncommon for doctors to be unable to pinpoint an exact reason why a child is born with this condition. Family history. If either of a child’s parents had a cleft lip or palate, their baby is more likely to have the same problem. Substance exposure. If a woman smokes cigarettes, drinks alcohol, or takes certain medications during pregnancy, cleft lip and palate may be more likely to occur in her child. Mothers who are diagnosed with diabetes prior to pregnancy may be more likely to have a child with a cleft lip or palate. It is possible that obese mothers are more likely to give birth to children with a cleft lip or palate. Cleft lip and cleft palate are usually recognized at birth, and doctors can start working right away to correct the problem. They may refer parents to a Houston oral surgeon who is experienced at performing the procedures that will help the child’s orofacial structures to function normally. The surgeon will work alongside other specialists, such as an orthodontist, plastic surgeon, and others, to create a treatment plan to help the baby. Often, it is possible to carry out the surgeries in a way that leaves minimal scarring. In addition to surgeries in childhood, someone born with a cleft palate may need to visit oral surgeons in Houston later in life to correct developmental problems with the jaw or teeth. Cleft lip and cleft palate are serious conditions, but fortunately, it is often possible to fix these issues so a child can live a normal, healthy life. Dr. Steve L. Koo is one of two Houston oral surgeons at Piney Point Oral and Maxillofacial Surgery. He has a particular interest in cleft palate surgery. If you would like to learn more about his expertise in this field, contact us at 713-783-5560.
by: Dr. Steve Koo at November 7, 2018 .